2009 is a year of anniversaries for China, with the 90th birthday of the May 4th Movement coming in the spring and the 60th of the PRC arriving in the fall. With this in mind, we've asked Samuel Liang of the University of Manchester, a specialist in Shanghai's built environment, to provide our readers with background on a locale that has special significance for both of the just-mentioned anniversaries. Namely, the building where an early meeting of the Communist Party was held in 1921, which stands near the recently built shopping and entertainment district known as Xintiandi. This structure, often treated as a sacred revolutionary shrine, has a complex history, as readers will see. It is tied to the May 4th Movement because many of those who attended the Party Congress held within its wall, including Mao Zedong, had been active in those 1919 protests and the general "New Culture" intellectual fermentation of the time, and as a birthplace of the Communist Party it is tied to the founding of the PRC in even more obvious ways. In the late nineteenth century, foreign landowners and Chinese builders jointly created lilong compounds for Chinese residents in the foreign settlements of Shanghai. Somewhere between enclosed compounds and open alleyways, the lilong houses opened up traditional walled domains, generated fluid spaces between houses, neighborhoods, and streets, and accommodated a wide range of commercial and residential functions and people from all walks of life. Toward the end of the Qing dynasty, traditionally-trained scholars sojourning in Shanghai were influenced by modern nationalism, thanks to the print media introduced into the city from the West, and they often disseminated revolutionary ideas of overthrowing the Manchu empire when meeting in courtesan houses in the lilong neighborhoods near Fuzhou Road. It was in such obscure spaces that the first group of radical, progressive intellectuals emerged from the community of self-pitying and discontented literati at the turn of the century. After the May Fourth Movement in 1919, a new generation of Chinese intellectuals embraced the Western ideals of democracy and science and enjoyed the city’s new, Western-style public spaces, such as coffee houses, cinemas, and public parks. Yet the living quarters of the new intellectuals were still in unassuming lilong neighborhoods of mixed functions, which had mushroomed in the new urban areas as the city expanded rapidly in the 1920s and 30s. When communism was first introduced to China, it also flowered in the milieu of Shanghai lilong. The most radical thinkers and activists of China used the lilong’s inclusive and obscure spaces as their covert bases to promulgate revolutionary and iconoclastic ideas. In July 1921, thirteen delegates, including Mao, from around the country and two representatives of the Communist International gathered in the small living room of an unassuming lilong house in the newly urbanized Taipingqiao area of the French Concession and held a secret meeting to found the Chinese Communist Party (CCP). The meeting is now considered to be the First Congress of the CCP. The house, 106-108 Wangzhi Road, was at that time the sojourn residence of the Wuhan-based official Li Shucheng and his brother Li Hanjun. The latter hosted the meeting but soon left the party because of his different political viewpoints. In the next year, the Second Congress of CCP was held in another lilong house a few blocks away, which was then the home of Li Da. Around that time, the residences of the party leaders, such as Chen Duxiu and Li Da, were in fact the Party’s undercover offices. Born in the lower strata of the urban environment, the Party had never succeeded in coming to power through urban revolutions. Though a small number of its agents continued to carry out “underground works” in the city, the Party achieved its final victory through successful managements of its rural bases. When the Party’s peasant army finally took over Shanghai in May 1949, the city as the Party’s birthplace was hardly known. 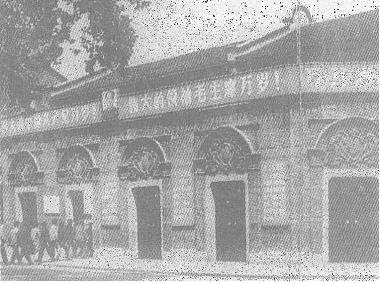 In September 1950, the Propaganda Department of CCP Shanghai Committee set out to search for the site of the First Congress. 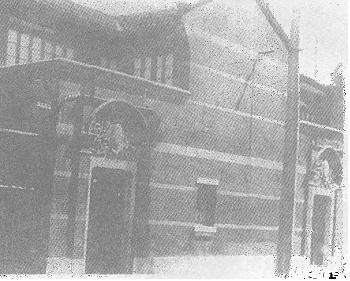 Assisted by Yang Shuhui, the wife of the Congress delegate Zhou Fohai, the Department rediscovered the former Li residence in April 1951; its new address was 76-78 Xingye Road, which, renamed in 1943, had turned into a busy street quite different from the former Wangzhi Road next to a vegetable field thirty years ago. The house was then used as a small noodle workshop and store, which had a traditional shop façade featuring a dark stone portal on a white plastered wall. 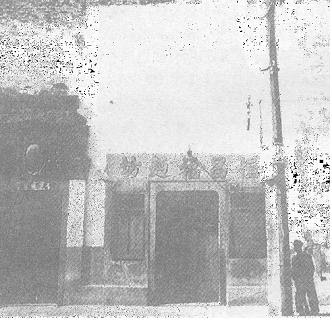 76-78 Xingye Road in 1951 when it was rediscovered as the CCP First Congress site (source: Lu and Zhang 2001). Inside the CCP First Congress Memorial, 1951 (source: Lu and Zhang 2001). 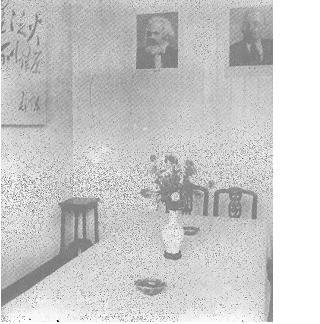 The Party committee immediately rented the house from the private landlord and, after consulting the Congress delegate Li Da, recreated the Congress meeting room on the second floor of 78 Xingye Road; in the room were displayed the portraits of Marx and Lenin and Mao’s handwritten script: “Little sparks spread into a prairie fire.” On July 1, 1952, the city’s official newspaper Jiafang Daily announced that the Shanghai Revolution History Memorial had been preliminarily completed after one year’s repair and renovation, featuring an article lauding the city as the original site where sparks of revolution fire first spread out. The key city officials visited the site on the same day. Shortly after, the chief of National Relic Bureau visited the memorial from Beijing; he considered the memorial’s current outlook and layout as not genuinely reflecting the original condition of the Congress site. In June 1953, the white-washed walls of the memorial building were restored to their “original” brickwork and the commercial signs of the noodle workshop and the next-door pickle store were also removed. The partially restored CCP First Congress Memorial, 1953 (source: Lu and Zhang 2001). In the restoration process, the memorial officials interviewed the landlord Madam Chen and her tenants for a history of the neighborhood. In 1920 Chen built a small lilong compound called Shudeli, which consisted of two rows of houses. 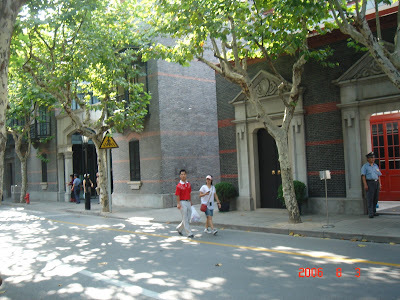 The front row facing Xingye Road had five units (100-108 Wangzhi Road); each unit was one-bay wide and two-story high and had a small courtyard behind the front entrance. The Li brothers rented two units right after the compound was built. They moved out about three years later and then Chen let the whole front row to a merchant, who extensively rebuilt the complex into two bigger units: 100-104 became a three-bay house and 106-108 a two-bay house. The courtyards of 104 and 106 were rebuilt into the houses’ two new wings. The merchant then opened a soy sauce and pickle store in 106-108 and sublet 100-104. In October 1957, following Beijing’s further direction on faithful restoration of revolution heritage sites, the memorial restored the complex’s the five stone portals and courtyards. And the Congress’s meeting venue was now set in the downstairs living room of 76 Xingye Road, which was then meticulously furnished for its original appearance in the 1920s, and in which no portraits or handwritten scripts of the leaders were displayed again. Now the memorial complex was given a monumental façade of grey brick walls, red arched portals, and dark wooden doors. Seeking to recreate the original form of the Congress venue, the restoration project in fact produced a monument free from any traces of the lively lilong neighborhood of mixed functions and inclusive spaces. It was a purification process against the locale’s combined commercial and residential contents. The result was a uniform façade and dead (or monumental) space rather than the original unassuming neighborhood where the secret meeting took place. By erasing the locale’s natural and evolving history through the decades that had bred rebellious potentials, the regime installed a hegemonic power structure, which the memorial symbolized, to prevent any future revolutions. As soon as the revolutionary process turns into a monumental space, its beautiful soul gets lost. The monument is then an empty shell that attempts to eternalize a reinvented past by terminating the place’s living, natural history. After the restoration, the Revolution Memorial was open internally to the Party cadres. In March 1961, the memorial was designated as a “Key National Cultural Heritage Site.” During the Cultural Revolution, the rebels/red guards filled the memorial with posters and slogans, turning it into a stage of their revolutionary activities. In 1968, it was formally renamed the CCP First Congress Memorial and opened to the public. To accommodate the increasing amount of visitors, in 1973 the memorial incorporated the four housing units in the back row of Shudeli as auxiliary spaces. In 1984, Deng Xiaoping handwrote a title plate for the memorial. The CCP First Congress Memorial during the Cultural Revolution (source: Lu and Zhang 2001). The history of the memorial has been reconstructed by the memorial’s officers and researchers since the 1990s, coinciding with Shanghai’s rapid development. Before this time, the memorial was mainly regarded as a local base for revolutionary education, not a national monument of revolutionary history (probably because the Party still considered Shanghai a stronghold of the “bourgeois lifestyle”). From Mao’s perspective, the Chinese revolution started in remote rural areas. For decades, as featured in primary-school textbooks, the iconic birthplace of the CCP had been a tour boat in the South Lake at Jiaxing, about sixty miles from Shanghai; the boat is a remade copy of the one on which the Congress delegates held the last day’s meeting after their secret meeting venue on Wangzhi Road was discovered by the French Concession police. As the last refuge of the secret meeting, the tour boat and its idyllic setting better represented, and indeed anticipated, the late course of the Chinese revolution history. In the meantime, the Maoist regime continued the revolution legacy by mobilizing the masses in a series of political campaigns—an ongoing violent, destructive process rather than peaceful commemoration of the revolutionary past. Turning that legacy into static monuments would be against the true spirit of revolution, and similar to the revisionist approach of the Party’s bureaucrats, against whom Mao launched the infamous Cultural Revolution. For Mao, revolution had be powered by endless class struggle, as he wrote when organizing Hunan peasant revolts in the 1920s: “A revolution is not a dinner party, or writing an essay, or painting a picture, or doing embroidery; it cannot be so leisurely and gentle, so temperate, kind, courteous, restrained and magnanimous…” Neither is revolution, I might add for Mao, a peaceful pilgrimage to a revolution museum. In the late 1990s when Shanghai reemerged as a global city, the First Congress Memorial acquired a new title, “National Model Base for Patriotic Education,” and attracted an increasing number of visitors each year. The old complex of about 900 square meters became inadequate and overcrowded, with visitors often queued up on the street. 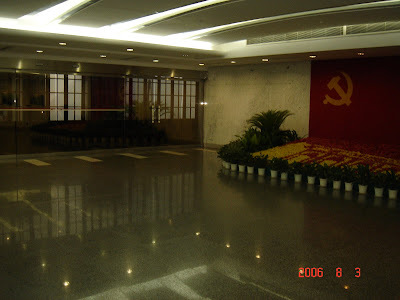 In 1996, the CCP Shanghai Committee decided to build a new wing for the memorial. Funded by private donations and assisted with volunteer labor, the construction project started in June 1998 and was completed just before the fiftieth anniversary of the “liberation” of Shanghai in May 1999. Indeed, the memorial is now a training ground for the Party’s future cadres and bureaucrats (urban economic development) and has probably superseded the Jiaxing tour boat as the icon of the CCP birthplace. It indeed symbolizes a new turn in China’s red course—a new urban revolution of demolition and rebuilding rather than the Maoist (anti-urban) revolution of class struggle. This new development is turning the whole city into a gentrified, museum-like space of visual display. In 2001, the two urban blocks surrounding the CCP Congress Memorial were developed by the Hong Kong-based Shui On Group into a trendy place of leisure and consumption, known as Xintiandi. Because the city’s planning code stipulates that the memorial be preserved and new buildings around it be of limited height, Shui On innovatively combined historic preservation and commercial development, making lilong architecture the theme of the project. Like the Congress memorial, the commercial spaces in this new development are sites of modern simulacra—be they of political propaganda or of consumerist persuasion. Here, indeed, the work of the architect and developer is comparable to that of the Party in rebuilding the memorial. While the latter retrospectively invents the revolution history as an ideological structure of the ruling class, the former re-manufactures the colonial and socialist neighborhood into a consumer paradise for the new elite class. Now global capitalists such as Shui On cooperate with the local government to carry out an urban “revolution” in Shanghai—one of space and architecture. This revolution targets the decayed lilong neighborhoods and entails the relocation of the residents (socialist workers from the Maoist era) from the decaying urban core, which is then reclaimed or, rather, re-colonized by the transnational elite. Lu Miqiang. 2002. “Yida huizhi jianguan 50 nian lishi zhi huigu.” Shanghai dangshi yu dangjian, 2002.9: 28-30. ----. 2001. “Zhonggong yida huizhi xiushan fuyuan jishi.” Shiji, 2001.2: 8-11. Ni Xingxiang. 1999. “Xiangei Shanghai jiefang 50 zhounian: zhonggong yida huizhi jinian guan kuojian gongcheng xunli.” Dangzheng luntan, 1999.6: 20-22. Zhao Zhengyong. 2001. “Zhanyang ‘taiyang’ shengqi de defang: Ji canguan zhonggong ‘yida’ huizhi jinianguan.” Zhibu jianshe, 2001.8: 42-43. For an assessment of the CCP’s governance strategy and contemporary Chinese politics, see. Perry, Elizabeth J. 2007. “Studying Chinese Politics: Farewell to Revolution?” The China Journal, 57: 1-25.